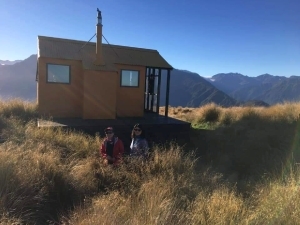 CARRINGTON HUT VIA ANTI-CROW HUT, following the Waimakariri River. DAY 1. 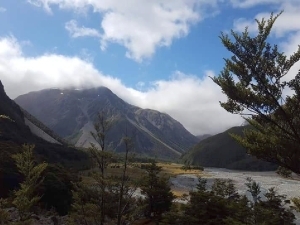 We parked our rental van at Klondike Corner and set off from Bridge over Waimakariri River. At 9am set off on the undulating bush walk along river for an hour, then opened to grassy flats, with occasional shingly stream beds to cross. We enjoyed the colourful lupins and valley flowers. Blue sky and sunshine was enjoyed all the day and provided stunning scenery for our keen photographers! 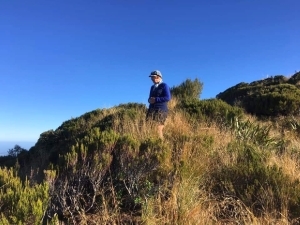 Finally reached the headland bush track to Anti-Crow Hut, but we’re advised to avoid it with a steep drop at the end. Walked on river bed and through streams around a headland to the hut where Jeff was waiting for us. Lunch stop and devotion by Barbara about enjoying God’s beauty and it’s links to our Christian walk. At 1pm continued on bush walk (1 hr) to river bed. Crossed full width of Waimakariri River to distant headland, rounded the corner and continued up River bed, gradually crossing streams back to True Right Bank. Some found the shingle walking difficult and slow. 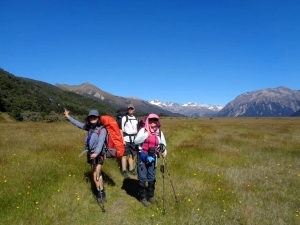 Finally took the bush track, followed by a grassy flat path for the final section to Carrington Hut - arriving after 5pm. Plenty of available bunks for us. DAY 3. Over breakfast Barbara shared a devotion about having courage to try new things. Also lessons to learn from our river crossings experiences. (Always treat a river like a track junction – wait for the complete group before proceeding). Departure at 9am into the bush, helping one another scale the rocky ascent up to the headland bush track. It had rained overnight and drizzled light rain all the way out. After a brief snack stop half-way, we trod on to the end to meet the van pick up, collected by the faster walkers at the front. Heavier rain started right then as we drove back to Arthur’s Pass. 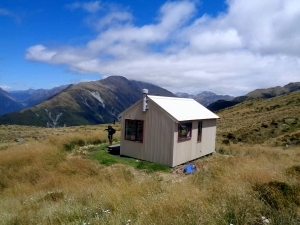 Accommodation in Christchurch trampers Tramping Hut, which Phillip kindly organised for efficiency! 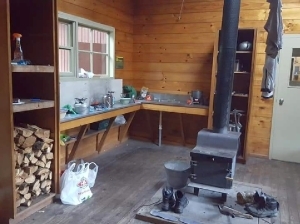 MT BROWN HUT – Lake Kaniere, Hokitika. DAY 1. Having driven from Arthur’s Pass to Hokitika, we headed off for the track start at Geologist creek, Lake Kaniere. Entering the bush, we started at a steady pace, but soon the fax96 persevered, climbing onward and upward, hour by hour! Once above the bush line, some muddy, swampy sections and a cool wind on the tops. The weather was cloudy and dull. Final arrival at the 4 bunk hut at 4.46pm, we were warned about the resident wekas that had already attempted to steal Rogers shirt (which he retrieved) and his light shoes in a plastic bag, which had totally vanished. Phillip shared devotions. The day began with a cloudless sky and bright sunshine, once it rose over the close-by mountain ranges – what a sight! The view below of Lake Kaniere was a stunner. 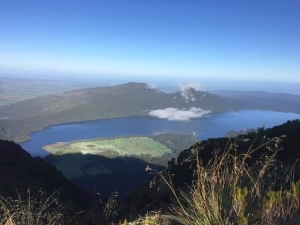 After breakfast several of the group climbed higher to reach the summit of 1270m for an even broader view. Three began the descent towards the Styx River at 8.30am. Others followed at 9.30am and had caught up with the front hikers within an hour. Descending the tussock terrain led to a deep gully to cross, before meandering in bush with spongy moss footing for a while. Then the steeper descent followed and continued for some hours! Near the Styx River there were two vertical sections of track, which Phillip had to guide our footing and hand holds on trees and roots for us to descend safely. Then a narrow ridge with a very slim track in places. Finally we reached the river level, and came out to cross a side stream, and then were able to follow rocks on the same side of the river (avoid the crossing mentioned in the track description) where we found some of the front group coming back to meet us. Lastly about 30 min across farmland took us to the road where our van was waiting, thanks to Simon who had walked extra distance (back to Geologist Creek) to bring it nearer. We returned to Hokitika Holiday Park where we all shared in a celebration meal! DAY 1. 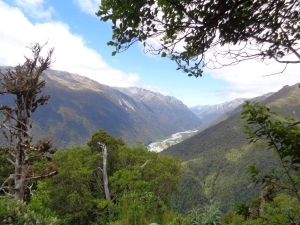 Tues 8 Jan. After driving over Arthur’s Pass, just north of Otira on SH73, we crossed the Kellys Creek bridge, turned immediately left of the highway to find the car park for our track. Four of us set off from car park at 9am in warm sunshine, while Simon drove the other group to alternative tramp start, and returned to follow us, starting at 10am. A stream crossing at the start led to a rocky track, climbing gently at first, alongside the rushing stream. A steeper bush track led upwards away from the stream, continuing for several hundred metres before levelling a little mid-way. Simon joined us here. Rests on logs and tree roots were welcome, and a lunch stop too, as we made the steep climb. After a second steep climb we reached the bush line. A track sidling around the ridge gave an easier grade, but still with some rocky steps up! The sight of mountain daisies and alpine plants cheered us on. Finally, we emerged onto the tops in view of the Hut. 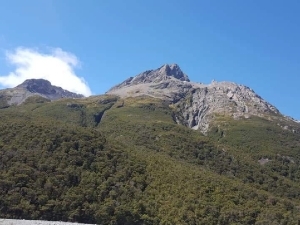 After hot drinks Simon, John and Kim ascended higher to the Kelly Saddle (1165m) and Kellys Hill (1394m) for a greater view. After dinner devotions was shared by Kim, about taking your worries to God. A balmy evening drew us outdoors to enjoy the sunset. DAY 2. Wednesday 9 Jan. Leaving at 8.30am, we took the descending track at an easy pace to ‘save our knees’. Bandaging the most vulnerable knees and backwards climbing helped! 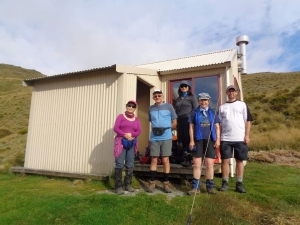 Reaching the car park by 1.00pm enabled us to purchase lunch refreshments at the Otira Coachman’s Hotel. This recommended stop is an entertainment in itself with such historic regalia as well as Middle Earth character models. 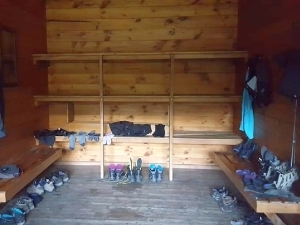 Back to the Christchurch Tramping Hut in Arthur’s Pass, Kim shared another evening devotions about keeping in close fellowship with one another and with Jesus.